​When we think of drought we generally think of water. Or rather, an absence of water. But what about recovery from drought? In terms of how plants function the return of rainfall does not signal an instantaneous return to business as usual. Rather, there is a time lag between when water deficit is relieved and when a plant community returns to its previous functional state. As the consensus expectation of global climate modeling efforts is a world of more extreme extremes understanding the interplay between drought and recovery is a baseline input into forecasting ecosystem resiliency and vulnerability. A complicating factor is that drought recovery has primarily been examined for individual plants or plant organs. Broad scale forecasting of land ecosystem impacts however requires a broader scale understanding of drought recovery. Our study weaves together various Earth observation data products to examine how drought recovery varies in space globally and in time across the 20th century. This requires datasets that can speak to broad scale patterns in both space and time. Here we used three independent data streams: a remotely-sensed vegetation index, upscaled eddy covariance data, and Earth system model output. We focus on gross uptake as a marker of ecosystem function. This is highly relevant in an era of rapid global environmental change as gross uptake effectively scrubs carbon dioxide from the atmosphere. Regrettably, our results suggest that, in the near-term future, the time between droughts will decrease just as the time needed for a system to recover will increase. That is, land systems--with added emphasis on the tropics and northern high latitudes--across the globe may enter a new normal whereby full recovery from drought is effectively precluded before the next drought event occurs. This has troubling implications for the land carbon sink--the innate ability of vegetation to remove CO2 from the atmosphere and so buffer climate change. In the worst-case scenario existent vegetation communities will no longer be able to function with widespread tree mortality (in forest regions) and land sink degradation (globally) the result. This will play out over the next decades, a highly relevant timeframe for addressing climate risk (e.g., Paris Accord). If droughts return more frequently and recovery times will shorten vegetation is likely to degrade and ultimately transition to a new state. 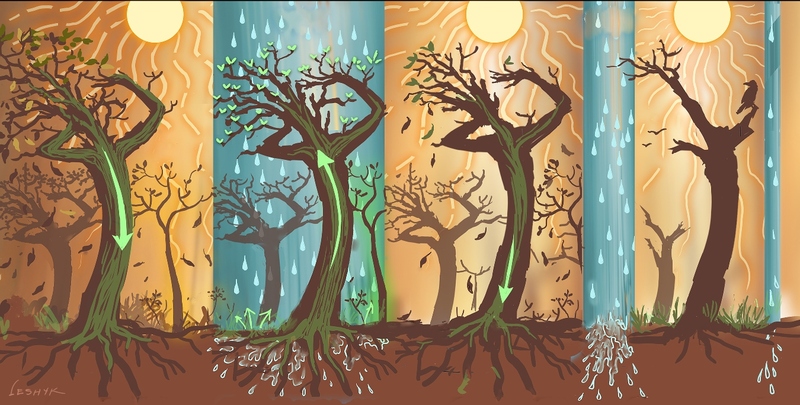 Widespread tree mortality and a weakening of the carbon land sink are plausible outcomes (Image by Victor O. Leshyk, Center for Ecosystem Science and Society).